techno-triumphalism at its finest. 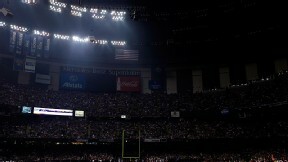 The AP documents the night the lights went out in NOLA. As we like to say in Brooklyn, not for nothing. But America is the country that developed the atom bomb and built the Internet, and we used to routinely put men on the moon–so much so that we got bored with watching it happen. But all of those events are in the rear-vision mirror. And last night at our Superbowl, our iconic annual event, an American bacchanalia viewed by hundreds of millions of people, we couldn’t keep the farkin’ lights on.